Perform this operation in the following cases. 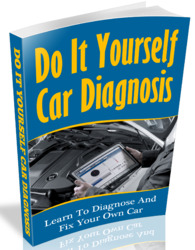 • When removing and installing "steering wheel", "tilt steering column"and "electric power steering gear". • When replacing EMPS ECU. (a) Place front wheels and steering wheel facing straight ahead. (b) In case of using TOYOTA hand-held tester: Perform the torque sensor zero point initialization. 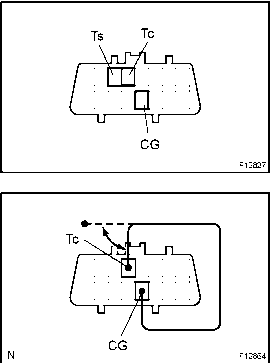 If the EMPS ECU is replaced, however, this operation is not necessary. 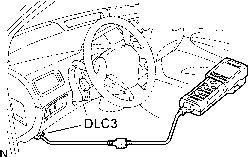 (2) Hook up the TOYOTA hand-held tester to the DLC3. (3) Select the "TRQ SENS ADJUST" mode on the TOYOTA hand-held tester. (4) Select the "ZERO POINT INITIALIZE". (5) Following the screen instructions, perform the torque sensor zero point initialization. Please refer to the TOYOTA hand-held tester operator's manual for further details. (c) In case of not using TOYOTA hand-held tester: Perform the torque sensor zero point initialization. (4) ON and OFF the terminal Tc of DLC3 20 times within 20 sedonds. (5) Check that the DTC C1515/15. (d) In case of using TOYOTA hand-held tester: Perform the torque sensor zero point calibration. Don't touch the steering wheel. (1) Select the "TRQ SENS ADJUST" mode on the TOYOTA hand-held tester. (2) Select the "ZERO POINT ADJUST". (3) Following the screen instructions, perform the torque sensor zero point calibration. (e) In case of not using TOYOTA hand-held tester: Perform the torque sensor zero point calibration. • Don't touch the steering wheel. • Check the DTC except C1515/15 is not output. (1) Stop the vehicle and turn the ignition switch OFF. (2) Using SST, connect terminals Ts and CG of DLC3 and ignition switch ON. What is a Toyota Yares Torque sensor? How to calibrate steering wheel sensor toyota? How to zero point calibration torque sensor? 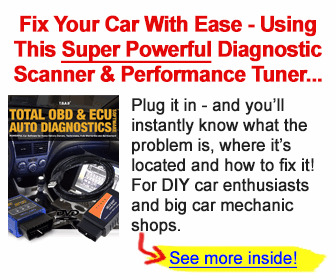 How to service prius torques sensors? How to calibrate steering torque sensor corolla? What hand held tool calibrates toyota steering sensor? How to performToyota 2001 prius zero point calibration of the Torque sensor zero point.? How to calibrate dtc c1515? How to calibrate dtc c1515 for belat? How to perform torque sensor adjustament in prius? How to set zero point adjustment on Toyota Crown torque sensor? How to torque sensor zero point adjust prius? How to zero point calbration toyota prius? When should the torque sensor zero point be calibrated? How can i perform the torque sensor zero point calibration? How to callibrate prius zero point? How to calibrate torque sensor zero point for crown? How to Torque Sensor Zero Point Adjustment Undone? How to calibrat torge sensor on toyota highlander 2010 manually? How to set torque sensor zero point calibration on Toyota highlander Hybrid 2007? How to reset toyota steering torque sensor zero point calibration? 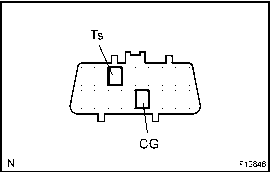 Is calibration required when removing and installing toyota wave radar sensor ? Where are the torque sensor on a 2006 toyota prius? Why zero piont steering reset?